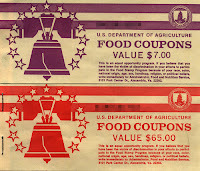 Our family struggled financially early on, and we relied on the food stamp program to buy our groceries. Our family of four qualified for $75-$150 a month (circa 1996), depending on our income. 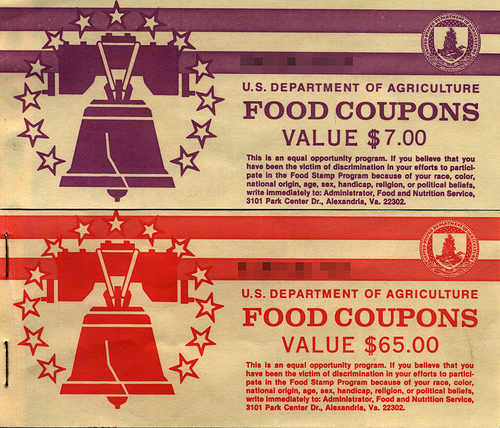 At the time, food stamps came as little booklets of bills that looked a great deal like Monopoly money - right down to the different colors for different denominations. That's pretty much where the fun stopped. My husband had a college degree, but jobs were scarce so we were doing exactly what so many pundits say you should - working wherever and whenever there was an opportunity. As a result, we both worked at jobs that paid just a few cents over minimum wage and had no benefits: no health insurance, no paid sick days, no vacation days. 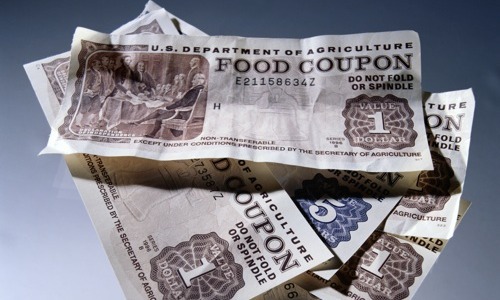 Although the food stamp program was intended to supplement our food budget, all too often it was our entire food budget. That's what happens when you don't have paid sick days - if you get the flu and can't go to work for a day or two, you just decimated your paycheck. Savings is a mythical animal you've heard about, but never seen. We almost never ate meat. Fresh fruits and vegetables were in the same category as Baked Alaska - a walk through the produce department was a kind of sick torture. Healthy food options for four ate up too much of the monthly food budget, so to make sure our kids were able to eat well my husband and I ate a LOT of beans and rice...or just didn't eat at all. It was common for us to eat one meal a day. Even the mildest illness was devastating because we didn't have the reserves to fight it off. Every cold became bronchitis, and each bout of bronchitis flirted with pneumonia. Our kids were covered through the state health plan, but we weren't. The sound of coughing in the night still has the power to illicit extreme anxiety. I became very skilled at keeping track of how much everything cost, and if there was something special coming up in a few months (like a birthday), saving just a little each month so that we would have enough to buy ingredients for a cake. But that was fraught with hidden dangers, too. One event still stands vividly in my memory, even now, close to two decades later. My oldest son's birthday was coming up, and I'd carefully saved a few food stamps each month so we'd be able to have a little birthday party. The day before his birthday I took both of our boys to the grocery store (we walked the two miles there and back - our car wasn't working...again...and we had no money to pay the $50 to have it fixed). I shopped carefully: a bag of confectioner's sugar to make the frosting, a container of six eggs to make the cake (I already had the flour, sugar, and oil), a small package of hot dogs and a small bag of frozen french fries (the meal our son had requested), and the big splurge - a container of chocolate ice cream and a small bag of M&Ms. The whole thing came to just under $10 - a significant portion of our monthly food budget. We got in line, and I could feel my anxiety rise. I'd traveled this path before, and I knew what was ahead. I put our groceries on the belt and pulled out the food stamps I'd hoarded. Immediately, the cashier frowned. Then she sighed loudly. The customer behind us clucked her tongue and shook her head. I waited to see which one would speak. It was the customer...this time. "You know, my tax dollars are paying for that crap." I froze. My boys froze. Helpless humiliation rose and stained my cheeks red as I silently handed the brightly colored currency to the waiting cashier, who rolled her eyes and sighed again. I'd learned through hard experience that trying to explain would be useless. This woman, with her grocery cart full of name brands and non-essentials like fruited yogurt and grapes, would never understand the world we lived in. My oldest is serving in the Navy now. My youngest will graduate from high school this year. And I still find myself carefully vetting my grocery list, conscientiously comparing the costs of different versions of the same food, and having to convince myself that it's OK to buy fresh green beans instead of frozen. My husband and I recently signed up for a service called eMeals (see the banner at the bottom of this page - feel free to click it and explore) to help us plan our meals and eat more healthy foods - particularly fresh fruit and vegetables. The biggest struggle I've had with this program is accepting the cost of healthy food. After all this time, it's still difficult to pay for fresh food that's good for me...even though I know that if we don't spend that extra money at the grocery store, we'll be spending far more at the doctor's office when our health suffers for it. Poverty leaves behind wounds that do not fully heal, and the callous judgement and disdain of those in the community who have never struggled to that extent simply pours salt in those wounds. I love the SNAP challenge, and I truly appreciate everyone who takes part in it, but I believe it is important to realize - there is a light at the end of your tunnel. You know that this will end, and when. For those truly dependent on the assistance these programs provide, there is no light, no guarantee of an end. We have to find a solution, and to do that we have to give up our inclination (as a society) to believe that people need to "deserve" assistance. In order to make a real difference we will have to be willing to accept that there will be some who take advantage of the system, and consider that cost cheap in comparison to the benefits reaped.